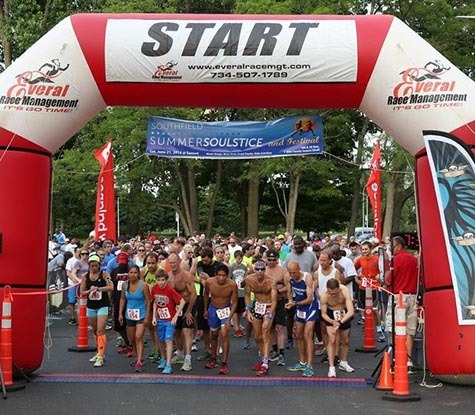 Runners line up for the start of the Summer Soulstice race near the Ridler Field House on the campus of Lawrence Technological University in Southfield. Nearly 300 participants and dozens of volunteers arrived at Lawrence Technological University (LTU) on the evening of June 21 for the Southfield Summer Soulstice. The 5k/10k run and one-mile walk was a joint venture between the City of Southfield, LTU, and Run as One Productions, LLC. The name represented the soul-embodying elements of healthy lifestyle and outdoor celebration in the community. The event raised $2,500 for local charities – Boys and Girls Club, Make-A-Wish Michigan, Parkinson Foundation, MS Society, and Southfield Firefighters Charity. There was a live-music stage, various activities for children, a beer tent, yoga, and two food trucks, Jacques Tacos and Treat Dreams. “This was a great event for everyone to see what goes on in Southfield, enjoy a festival on a Saturday night in the summer, and support local charities,” LTU Student Engagement Coordinator Phil Lucas said. People of all ages and abilities participated in the running and walking events, including many who overcame physical adversity. The race landscape in the City of Southfield provided a truly distinctive route. The course wound alongside skyscrapers, wooded trails, LTU’s campus quadrangle, and finished near LTU’s Don Ridler Field House. Mechanical engineering student Mike Pruski, who resides in Southfield, loves to support these kinds of activities. “Events like this are a great way to help students feel more connected to both their city and their university,” Pruski said. Ibrahim Huthman, an international student from Nigeria studying civil engineering at LTU, enjoyed the atmosphere of the festival and is “already looking forward” to the next race. The race committee would like to thank all the participants, sponsors, and ‘Soulmate’ volunteers. Supporting sponsors included Brown & Brown Insurance, Concentra Urgent Care, the Skyline Club, the Southfield City Centre Advisory Board, and Vibe Credit Union. Absopure, New Balance, and Run Detroit provided in-kind donations. Local municipality support came from the Southfield Police Department, Southfield firefighters, Southfield Business Development, the Southfield Chamber of Commerce, and Southfield Parks and Recreation. Dozens of local businesses made donations, including the Lawrence Tech Barnes and Noble Bookstore, which provided apparel. LTU Dean of Students Kevin Finn believes that this is just the beginning of possibilities for the Southfield Summer Soulstice.